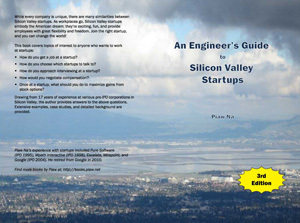 I've worked at 5 different startups in my career in Silicon Valley. While every company is unique, there are many similarities between Silicon Valley startups. As workplaces go, Silicon Valley startups embody the American dream. How do you get a job at a startup? If I don't have a green card, will changing jobs cause me to have a longer wait before I get one? How do you choose which startups to talk to? How do you approach interviewing at a startup? How would you negotiate compensation? Once at a startup, what should you do to maximize gains from stock options? Why is it advantageous to exercise your stock options in certain conditions? What do the clauses in your offer letter mean? How do the clauses in your stock options contract affect you?